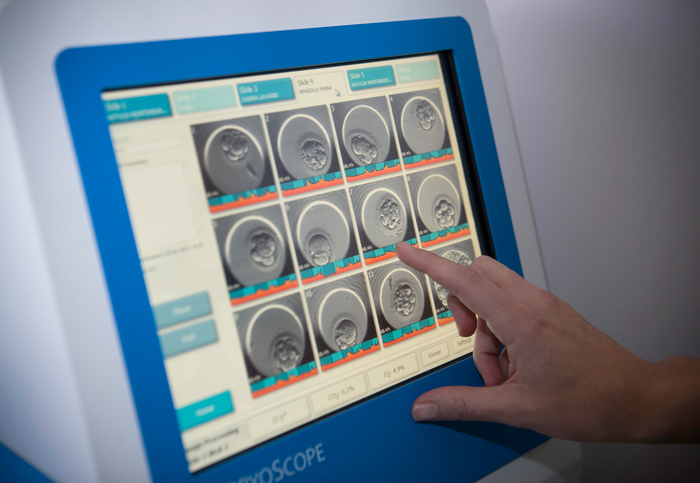 The Embryoscope is a new IVF incubator with a built-in camera for automated time-lapse imaging that allows us to monitor all fertilized embryos from conception until the time of transfer without taking them out of the incubator. The EmbryoScope slightly improves embryo culture conditions regarding traditional methods, therefore increasing the chances of achieving the pregnancy. Thanks to its time-lapse imaging system this new technology offers excellent information about each embryo without having to take them out to the incubator to see and/or manipulate them. Thanks to EmbryoScope a much more stable incubation is achieved without producing temperature and humidity changes, which allows us to obtain better quality embryos. Moreover, the EmbryoScope optimises embryo selection since, as it offers much more information about the embryo, it allows to detect morphological abnormalities that otherwise would have gone unnoticed. The embryos that present specific cell division timing and correct morphological changes have been proved to have between 10% and 15% more chances of implantation.